PVC deer feeders are usually the fastest and cheapest to make. They are gravity fed and work well to keep the deer fed. Diameter of pipe used will depend on how many deer you plan to feed, how often you want to fill the feeder, and what type of food you are putting in the feeder. PVC is easy to paint to blend in with your surroundings. I suggest cutting a 1 -gallon milk jug, large bleach bottle, or something similar to use as a funnel to put in the corn. Also, a lesson learned from experience, is not to make the deer feeder too tall. Remember you will be picking up a 40-50 ound bag of corn and lifting it up to fill your feeder. Even using a bucket, it is better not to have to use a ladder to fill your feeder. I also suggest making sure you have your threaded end of the pipe on top so you can use a screw on cap. You can also use elbows and "T"'s with threads so you can screw a cap on the feeding end if you expect a lot of wet weather. Piece of 6 or 8 inch diameter PVC pipe, about 3-4 feet long (or in this application: tall) One plastic bucket that will fit over the PVC pipe. However you choose, afix the pipe so that it will stand, securely upright. you can strap it to a tree, a 4X4 sunk in the ground, whatever. Mount it so that it is approx 1 inch above a flat surface. The ground will work, but a piece of plywood 2ft x 2ft is better. So, now you have a piece of pipe standing upright about an inch above a piece of plywood. Fill the pipe with corn. Some corn will spill out the crack and then the pipe will fill up. As the deer eat the corn, additional corn will spill out the 1 inch gap. Put the bucket over the top to keep out rain. Or, buy a PVC cap and slide it on. 1.Sand the top cap interior or top pipe exterior sufficiently so the top cap can be placed on and removed without binding. 2. Cut the 4" or 6" pipe to length a 10' length will make two feeders if not able to buy pre cut. 3. Glue the single or double "wye" fittingto the bottom of the feeder. Caution, the branch of the "wye" must point up to the top of the pipe. 4. Cut a small length of pipe just long enough to cement the bottom (straight through end) of the "wye" to the lower cap fitting. 5. Drill a half a dozen 1/8" weep holes in the bottom cap (or plug if using that option) so any rain water will drain. The gravity fed homemade deer feeder tube can now be attached to a post or wired to an existing tree. Cut the flared end off the 10' pipe. Cut the pipe into 3 equal length pieces, and sand the cut edges so they are smooth for an easy fit to the caps. Drill a 3/8" hole on the printed side about 4" from one end - this is for the nail that is holding the feeder onto a tree. The printed side will be against the tree. Put a large nail - 3" to 4" long, into the tree trunk at about eye level - 5 feet from the ground. Leave about 1" sticking out to hang the feeder. Attach the female Y connector to the other end of the pipe, with the Y facing the opposite direction from the drilled hole. You can use glue for a permanent connection, or the ½" wood screws for easy disassembly if needed. Pre-drill the holes for the screws with 1/8" drill. 2 screws should do for each connection. Attach a cap to the bottom of the Y with 2 screws. Try to use short screws so they don't protrude inside to hurt the deer. File points if necessary. Fill the tube with whole corn, loosely place the cap on top of the pipe, and hang from a nail hammered into a tree about 5 feet from the ground. I get my corn in bulk 40 Kg. (88 pound) bags from the local farm supply store. You can also blend in some oats, or cracked corn, but I find whole corn works great by itself, and easily slides through the pipe. If you have access to vegtable scraps, or stale vegetables or fruit from the local grocery store, just dump it on the ground near the feeders as a tasty treat. You may need to sand smooth the fittings so they fit easily together for assembly. Cut small holes in the bottom of the container so that it will not hold water. 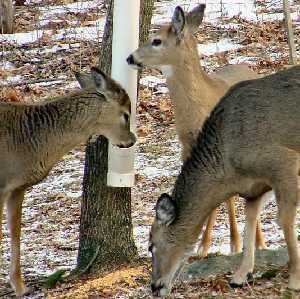 Stabilize your homemade deer feeder by fastening it to a tree or post. Start by cutting one end of the pipe at a 45 degree angle, this will aid in pounding it into the ground. Next measure 8-10 inches up from the end of the pipe you just cut. Cut in an opening, again using a 45 degree angle, the opening should be 4-5 inches long depending on the type of grain you are using. That's it, you just made a homemade deer/wildlife feeder. Once you find a good area, simply pound the PVC into the ground so that the opening is flush with the surface of the dirt. Fill with grain and then cover with a coffee can or some other means to prevent water from getting to the grain. To make a homemade deer feeder use a 4” PVC pipe and some plastic containers about 6” high and 16” square. Different diameters of pipe could be used with the larger diameters of course able to hold more feed. The plastic containers we used were reject pieces that we had around from a local factory. A 5 gallon plastic bucket would do just as well or anything that could be cut down to a 6” or so height. Cut a slot in the plastic pipe about 1 to 2” wide and about 3” in height in the end of the pipe that is going to be in the container. Fasten the pipe to one side of the container with the slotted portion towards the center. Not the best feeder I've seen, but it works. Watch below. It is a PVC pipe, with a bucket on top, set into a tray or trough. with shucked corn or rolled oats mixed with molasses. You can purchase the rolled oats with molasses at your local horse and cattle feed store. Put the pipe end cap on to keep out moisture, squirrels and raccoons. Cut 10" PVC pipe about 4 1/2 feet long. At the bottom cut a large C-notch. Six inches up inside the PVC, place a piece of aluminum angled towards the bottom to allow the feed to flow. Use screws to keep the aluminum sheet metal in place with the correct angle. On the top we used a piece of aluminum approximately 14 inches around and bent it on the edges. Then screwed the aluminum "top" down on the sides of the PVC pipe to prevent the feed from getting wet. To secure the PVC to the tree we used aluminum pipe hanger strips wrapped around the pipe and screwed them into the tree. We used two tree branches approximately 15 inches long and placed them under the sides of the PVC pipeto keep it off the ground approximately 2-3 inches. As you load the feed into the feeder, gravity will pull some of it out but we found that if you place yoour foot against the hole as you fill it it will fill up and not allow a lot of fed to spill. Our feeder's hold about 75-100 pounds of feed and last about a week. We made these feeders out of 24" driveway pipe, plyboard, and salt treated boards. Take the driveway pipe and cut it to the length you want it. Then cut your boards up however long you want them and screw 3-4 along the sides of the pipe but make sure you leave enough stickin out at the bottom that you can tack it to your plyboard with enough space for the corn to come out. When you have your board and pipe together set the side of the pipe with the ends of the boards sticking out on the plyboard and turn the whole thing over. tack the plyboard down to the boards with your drill or whatever you are using and then turn it back over. The last part is the easiest and all you do is screw a smaller peice of plyboard to ONE of the boards but leave it loose enough you can spin the lid around to put corn in it. With a big enough piece of pipe (we used 24") this should hold atleast 100lbs of corn or more and work extremely well. Here are some pictures of the ones we made but we havent put them up yet. From: Forums I like to use 4 inch pvc pipe, about 4 to 5 feet long. At the bottom, I cut a feeder hole, on the top cap off with a 4 inch cap to keep food dry. You can build a trough around it so food will be caught or simply drive the pipe in the ground about a foot, then cut a feeder hole in the bottom level with the ground so not to let out so much food. fill it up, Screw on the cap. Have Homemade Deer Feeder Plans To Share? Do you have deer feeder plans that you are willing to share for free? We would love to pass them on to others. Please include a picture if possible. Just type your instructions. Please include any parts needed, tools, and all the details we need to know. Your plans will appear on a Web page exactly the way you enter it here. You can wrap a word in square brackets to make it appear bold. For example [my plan] would show as my plan on the Web page containing your story. Three 5 gallon bucket feeder!